The next stop of our journey was the typical stop on any of the railway trips across Siberia: Irkutsk. 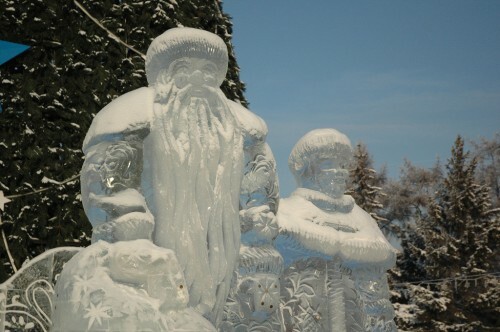 One could easily recognize that Irkutsk is a very touristy pace given the numerous options for accommodation as for example Yekaterinburg and also the attractions and options for tourists. Only 70km from lake Baikal and located directly on the Angara River, the city is a perfect base to discover Siberian life a little bit. 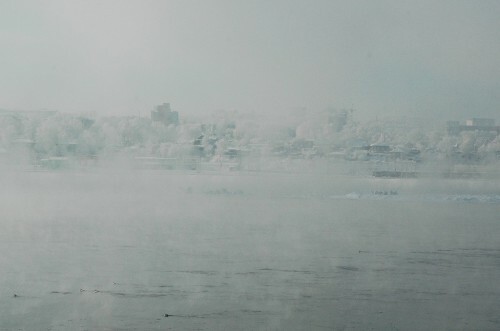 We decided to stay in Irkutsk for 4 full days. Hustling through the train station we left the train station ignoring all the taxi drivers looking for a stop of the trams. One short question and we knew where we could wait for the tram that would bring us to the old city center. With only a small detour we managed to find our hostel, where we woke up our hostess. Even though we had let her know that we would arrive in the morning, she apparently did not expect us this early. It was almost 10am and still dark outside. However we could still move our belongings into the apartment which consisted of three rooms for guests. Since we were traveling slightly out of high season, we had the whole apartment for ourselves. Galina took her time to explain where in the city we could find the nice places and where we could eat some cheap Russian food. Food is surprisingly expensive in Russia, the prices are comparable to Germany. The restaurants are mainly foreign and many cafes line the streets. Russian food is probably only consumed at home. Our first stop of the following sight-seeing tour through the historic city center was the hotel Irkutsk right around the corner from our accommodation. In the hotel we expected to be able to pick-up our train tickets to Harbin. The lady at the reception pointed us to a corner of the lobby which was a small travel agency. Unfortunately the lady inside the agency at first had no idea who we could possibly be and what we could possibly want. With a little bit of persistence on our part, she eventually remembered that she was supposed to hand out a couple of tickets for two foreigners. She pulled our tickets from a drawer, we double-checked them and happily left the place. Thus there was no problem with ordering the tickets on-line and picking them up in Irkutsk. We left the hotel Irkutsk and followed the water front of the Angara river down-stream to turn right into the old center after about a kilometer and a half. Since Lenka was already hungry fate pointed us to the Japanese street, where we could eat some delicious Pozi, a local specialty. The meat dumplings reminded me of what I had eaten in Central Asia about a year ago as Manti. Stepping out of the little restaurant we only had to continue down the street to arrive at the Kirov square. Besides the huge Christmas tree dozens of ice sculptures invited people of all generations to spend some time on the square. Ice sculptures seemed to become a common thread during this trip. From the Kirov square we followed the green sight-seeing path through the old town. It first led us to many churches on the way down to the Angara River. In the one cathedral we visited, people were busy preparing the place for the upcoming celebration of the orthodox Christmas festival. The green path continued from the old city center to the new center of town passing by many different trade buildings. The daily life in Irkutsk is definitely taking place in the new center, where huge markets and shopping centers are located next to a theater and a movie theater in the pedestrian zone. We started orthodox Christmas Eve with a typical Russian breakfast: We had Bliny (Russian pancake) with jam and pear pirogi. We spent half the morning chatting with Galina in her kitchen. She gave us some goo hints on what we could do during the day. We decided to continue our city tour from the previous day. One of the goals for the day was to get myself a Christmas present: a Siberian hat. The second dealer surprised me in that he gave me the hat at my offered price after some negotiation. I had already turned around, when he finally agreed. The difference of his initial asking price and what I finally paid as well as the salesmanâEURTMs behavior showed me two things: The salespeople are used to high paying foreigners and even though I did some bargaining, I probably still paid too much. The most important thing however was that I could get rid of my 2 US$ valued hat I bought last year in Turkmenistan and I would no longer have to worry about cold ears in Siberia of North-Eastern China. After some more sight-seeing in the city center, we once more headed down to the Angara River, where we crossed a bridge to visit the small island. However we soon saw a Russian laying in the snow pointing a gun towards the footpath where we wanted to walk. For our safety, we turned around and headed back to the city. We never learned whether the fellow was targeting animals or humans. However we knew that we were safe. For food we headed to a newly built part of the city, where the locals completely built a quarter of traditional wooden houses. There are still many 150 year-old buildings around the city, however most of them are facing the same problem: they are sinking into the ground. GalinaâEURTMs wooden house for example has sunken 1.3m since it was built. Today the window sills are at ground level. Some houses are in an even worse shape, because they are only sinking on one side and thus start to tilt. We finally spent Christmas Eve with the Russians in one of the many local churches. The service took more than two hours and featured many people coming and going the whole time as well as a lot of singing. The male choir was particularly impressing with its basses. Many choir director would wish for such basses. We suspect there might have been a few genes transferred from the Siberian bears. The third day we spent at the shore of Lake Baikal. By tram and minibus we headed to Listvyanka, the little touristy village at the South-West shore of the lake. During our stroll along the Eastern end of the village, we saw several Omul smokehouses. Omul is probably the most popular fish in Lake Baikal and the smoked variant seems to be the favorite of the local people. 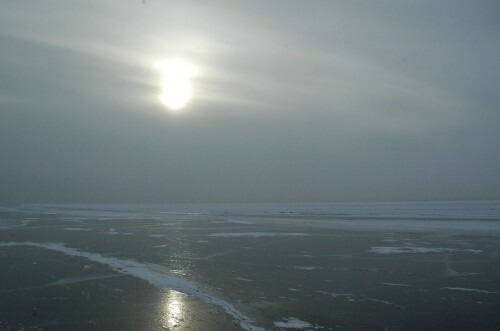 On Lake Baikal as well as on the Angara River we saw plenty of fishermen ice-fishing for the delicious fish. During our walk away from the water and into the hills we eventually hit the dog sledding station. 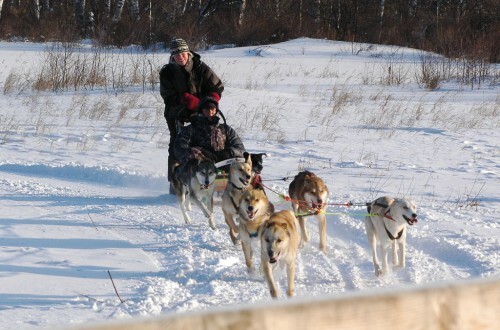 Dog sledding was one of the things I absolutely wanted to do while in Siberia. After a quick stint to organize the necessary money we could even afford it. A German couple was just returning from their trip and the girl was so excited, she almost couldnâEURTMt talk anymore. We later learned that she generally was very communicative which was good fun for a short while. Following the dog sledding we were hungry enough to look for some food on the way to the ferry harbor. 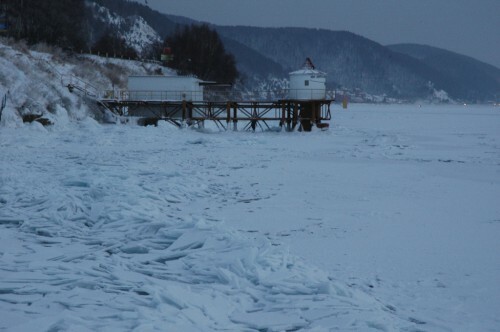 All through the winter the ferry runs across the Angara River where the water leaves Lake Baikal, since that part of the water is free of ice all year round. 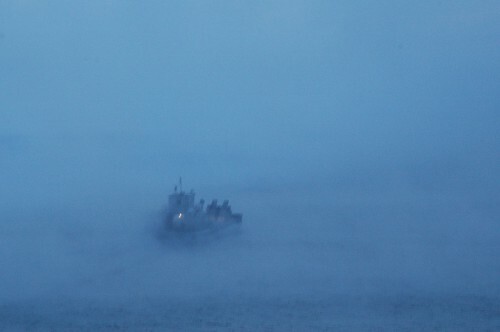 We were lucky enough to see the ferry disappear in the mist across the river. From that location one can apparently watch the lake freeze over which takes one to two days, typically in early January. On the way back to the hostel, we started chatting with on older Russian trader who himself had seen quite a few parts of the world. He told is about his career in the Red Army and how he instructed flight controllers all across the Warsaw pact and how he even invaded Czechoslovakia in 1968 and the time he spent in China. Judging by his looks it was quite difficult to believe all his stories, however considering that most of it happened before the revolution in 1991, they seem quite possible. It would be interesting what happened to him after the revolution. 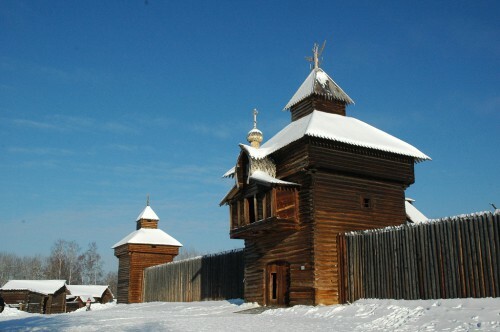 Our final day in the Irkutsk area, we spent in the open air museum of Taltsy, which is located about 20km from Listvyanka on the shores of the Irkutsk Sea, as the locals call their artificial lake. 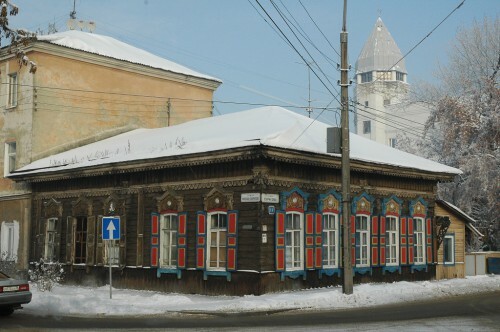 The museum has buildings from all around Irkutsk province, which is about the size of Western Europe. The buildings date back to the 17th century and display the development from Nomadic buildings to big settlements and mansions. Another interesting difference among the buildings is the amount of money they must have had in order to own such houses. All of Siberia is Occupied by Russians! All of Siberia? We were surprised to see so many cars parked in the parking lot of the museum, but to meet only so few people around the historic buildings. We finally found the other visitors near the Irkutsk Sea, where there werenâEURTMt only barbeques and samowars, but also three large ice channels for sledding. 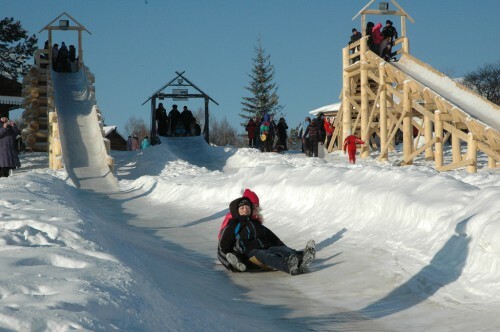 All generations enjoyed themselves on the icy and fast ride. Next to the sledding there were some smaller attractions, where one could win prices by firing ice balls onto targets are have fun jumping in a huge air filled mattress. We primarily enjoyed the beautiful weather and the fresh air. In order to head back to the city, we placed ourselves on the side of the road to hail down the next passing minibus. Before a first minibus showed up, a nice Russian couple stopped and thus we hitchhiked back into the city. Fortunately we only needed to go to the Solcheniy Mikrorayon, where they had to pass through anyway. There we headed out to the ice fields where Irkutsk people skate on the Irkutsk Sea and where the ice breaker Angara is located. In the evening we enjoyed a real Russian dinner in our hostel. She didnâEURTMt disappoint us with a typical seasonal meal. We particularly enjoyed the poppy seed pirogi for dessert. Unfortunately they disappeared very very quickly. Finally we had to pack our belongings, since we had to catch the 8:27am train the next morning. The train 20 was supposed to bring us to the Russian-Chinese border an on to Harbin in North-East China. This entry was posted in Trans-Manchurian Railway, Travels and tagged Baikal, Irkutsk, Russia, Siberia, Travels by Oliver Meili. Bookmark the permalink.